It is definitely summer here in Phoenix — the sun is shining and our faces are melting! Somehow, Chef J has found a bright spot (pun intended) amid the suffering, and is willing to share it with us. Slather on the sunscreen and hit the farmer’s market this weekend so you can play along at home. Ok, Chef J, bring on the summer produce! Summer is terrible here. Phoenix in the summer is a proving ground for the resilience and stubbornness of humanity. You know that feeling when you watch yourself lock your keys in the car? That paralyzed, defeated, “Why did I do that?” feeling? That’s how everyone feels here in the summer. We all knew it was coming. It happened last year and we all swore we wouldn’t put up with it again. But here we are. Here we are, basting in our miserable sweat, cursing our inability or refusal to escape. A couple of weeks ago I espoused some of the positive side effects of the sweltering torridity; I still love BBQ, pool parties, and flip flops — but there is more to it than that. There are some wonderful things about this place that keep me around throughout the season! Since a blog about pretty girls in sun dresses probably wouldn’t work for this venue, I will stick to something we can all enjoy: Summer Produce! So in honor of summer, and to make up for all of the barbequed meat I have been eating lately, I will be enjoying two of my favorite summer vegetarian dishes this weekend. If you are not fortunate enough to be in Phoenix for the summer, I’m sure there are some fantastic ingredients available at your local market. Talk to the farmers, pick some summer produce that looks good, try something you haven’t had before, and enjoy the delicious treats growing all around you! *Sprinkle the eggplant with salt and set aside for 20-30 minutes. Rinse the eggplant thoroughly. 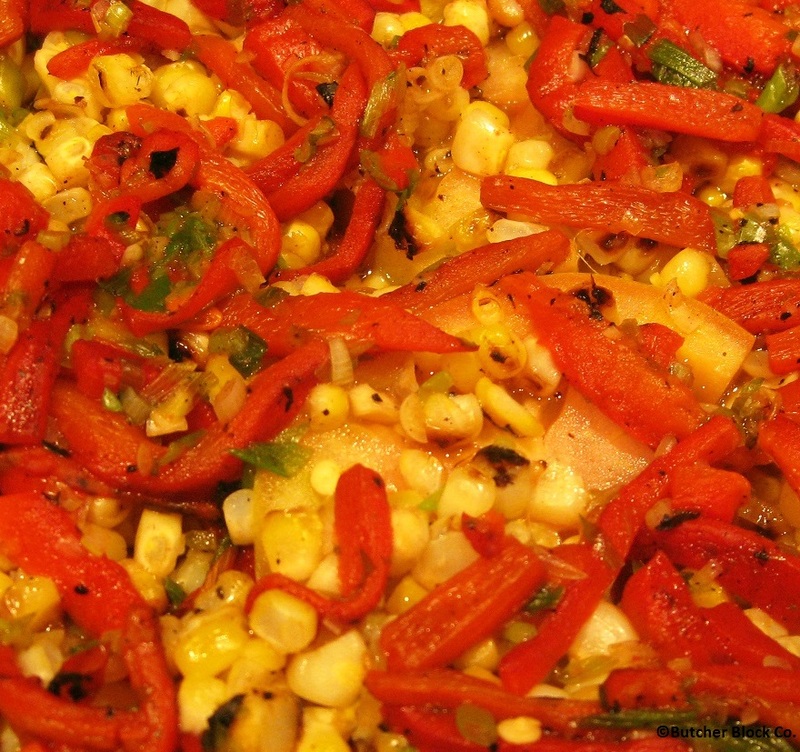 *Roast the peppers over an open flame until they are completely charred. Place them in a bowl and cover so they can steam. When they have cooled you can easily wipe off they skin with a paper towel- do not rinse them, though. Sauté the onion until brown, deglaze with red wine and remove from heat. Combine all of the vegetables and toss with olive oil, herbs, salt & pepper. Put them in a large baking dish, cover with foil, and bake for about 1 hour. You can also do this recipe on the grill — no need to heat up the kitchen if you’re cooking out back. Combine all ingredients and bake at 225 for about 2 hours. Combine wine, vanilla, honey and pits. Bring to a simmer and reduce until syrupy. 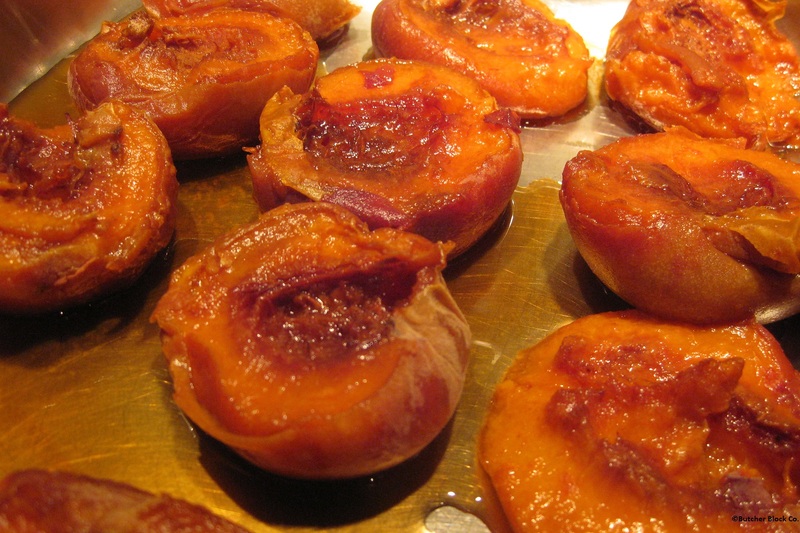 In a sauté pan, pour hot liquid over the peaches and braise until just tender. Top each peach half with a dollop of cheese mixture and sprinkle with granola.